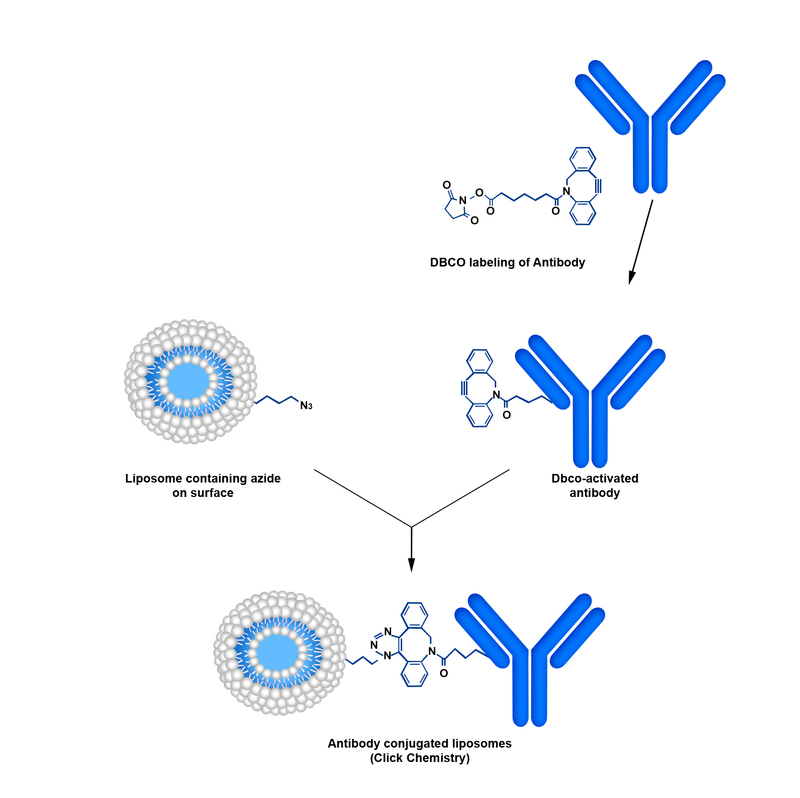 During the past five decades, various types of chemistries have been used for conjugation of molecules such as antibodies, peptides, proteins or other reactive ligands to the surface of liposomes. In general the conjugation can be achieved through the N-terminus, the C-terminus or the available sulfur (e.g. Fab’ fraction or thiolated antibodies). Not all chemistries have the same yield and efficiency of conjugation and often reproducing biocompatible batches can be a challenge. There are many commercialized reagents that can be used for DBCO modification of proteins, peptides and antibodies. To see the list of commercialized reagents for DBCO modification see here. For other reactive (PEGylated and non-PEGyalated products) Immunosome® products suitable for other types conjugation methods see here. You need the following materials and equipment in order to use the kit. The total lipid concentration in Immunosome®-Azide is 21.58 mM. 1% mol of the lipid in liposomes contains azide group and only half of them are exposed to the outside of the liposomes, which is equal to 0.11 mM of reactive conjugable lipid. For 2 ml volume liposomes, this is equal to 2.20×10-7 mol, and for 5 ml volume liposomes, this is equal to 5.50×10-7 mol of azide. Add 1 mol equivalent of Azide-lipids in liposomes to 2.5 mol equivalents of DBCO containing protein. Incubate the mixture of liposome and antibody at room temperature for 4 h followed by overnight incubation at 4 °C in a refrigerator. Reactions of DBCO and azides are more efficient at high concentrations and temperatures (i.e., up to 37 °C). In order to avoid denaturation of proteins, peptides and antibodies, it is recommended to incubate molecules with liposomes at room temperature followed by refrigeration (see step 1). Immunosome®-Azide is a white translucent liquid made of nano size unilamellar liposomes. Usually due to the small size of liposomes no settling will occur in the bottom of the vial. The liposomes are packaged in an amber vial. Immunosome®-Azide is made on daily basis. The batch that is shipped is manufactured on the same day. It is advised to use the products within 4 months of the manufacturing date.